Here at First Baptist Church we support a variety of missions. Please click HERE to open a .pdf version of the meeting notes. Pray we don't need it next time, but prepare to help others! If you are interested in joining our Disaster Relief Team there are many different ways to help. Contact the Missions Committee, get scheduled for training, and read lots of great information at www.flbaptistdisaster.org or on the Facebook page for Florida Baptist Disaster Relief. Our closest 2019 training is at Hiland Baptist Church in Panama City on May 18th. Please see the front page info, the Facebook page linked above, or contact the Missions Committee (through the church) for general info/admin. We continue to partner with Food For Thought into the 2018-2019 school year program! Meals are pre-packed and delivered to Bruner Middle School as part of our sponsorship, and we have successfully increased the number of meals provided as part of our Food For Thought partnership and thanks to our wonderful team of volunteers! If you are interested in helping, please contact the church (243-3163). Crop Drop 2018 -- Thanks (!) to our volunteers for this event on Sat, Nov 17th: This annual event distributes last-from-the-field produce from all over the SE region to those who are in need locally. 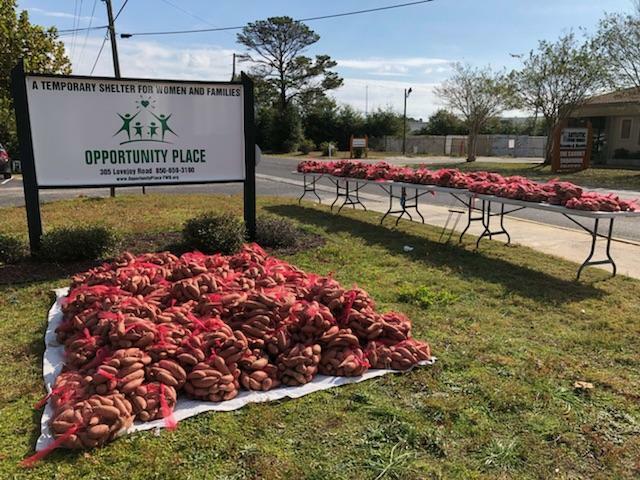 Thanks to the local organizers and for our 2018 volunteers who picked up and delivered over 400 bags of sweet potatoes to Opportunity Place and Catholic Charities. Click HERE for some photos and join us each year as we help put Missions In Action and support our local community. -- Watch for info on our 2019 Mission Trip opportunities!